Funtasia Daily - Filly Funtasia: New Filly Toy Line Spotted: Filly Ballerina! Not much is known about Filly Ballerina at the moment, apart from the information found here: http://www.top-media.de/start/detail_normal.php?id=3903&PIC=brandaktuell/080652-Filly-Ballerina-550.jpg. This page contains a few pieces of information, including the estimated time of arrival: Filly Ballerina is scheduled to arrive on the shelves in August 2017. 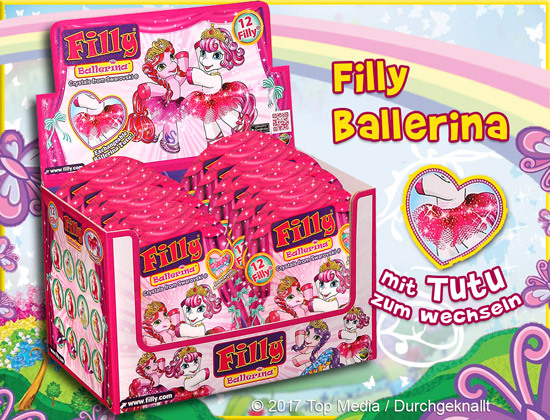 The toy line promises to deliver 12 new Fillys - that's roughly half as much as other primary Filly toy lines, and is more comparable to spin-off lines, such as Filly Mermaids and Filly Wedding. The actual status of Filly Ballerina is unknown. It may be a successor to Filly Royale, or a spin-off line like the aforementioned Wedding and Mermaids. It seems like the art style has undergone slight changes! The most notable difference is the eyes, which look very different compared to the previous lines. Regarding the toys themselves, the text on the pack says "Exchangeable Balletina Tutu". This most likely means that each Filly's tutu can be detached and reattached to a different Filly - personally, I adore this feature, after being disappointed with the inability to detach the mantles of Witchy Fillys. It should be noted that the background of this image reuses elements from some of the past Filly toy lines: the borders of the image are occupied by the purple butterflies, and the bottom-left corner shows the rainbow tree from Filly Butterfly; and the top of the image is graced with the Filly Rainbow - in the way it has appeared in most toy lines, although excluding, in particular, Filly Royale. And that's all the info we currently have! There is no website for Filly Ballerina yet (at least no public one), though it will probably appear closer to August.